Choose the Most Attractive & Sturdiest Nulaxy Adjustable Aluminum Cooling Ventilated Laptop Stand to Start a New Life Style! Aluminum Alloy Material - Best for Cooling your Laptop & Tablet. Ventilated - The laptop stand provides a better experience for you and better conditions for your laptop. 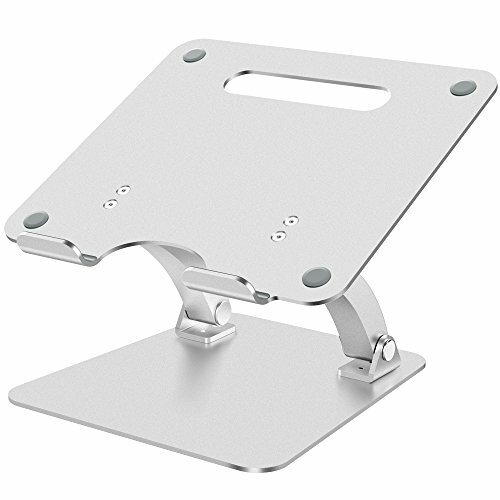 Adjustable - The height of the cooling ventilated laptop stand can be adjusted as needed. Creating a comfortable angle for reading or typing. Whether used at a desk or on the couch, the laptop stand can be easily adjusted for optimal comfort. 1.【Wide Compatiblity】Compatible with Apple Macbook Pro, Macbook Air and other laptops (10 to 17 inch), up to 6KG (13.2 lb). 2.【Maximum Cooling】Aluminum Panel with ventilator scoop to maximum cooling your Macbook, Notebook, iPads etc. 3.【STURDY CONSTRUCTION & RUBBER PADS】Durable aluminum body, with a sturdy construction, can hold your Macbook, Notebook, iPads steadily, rubber pads can protect your device from daily scratches and sliding. 4.【Ergonomic Design】Adjustable angle & height for comfortable visual effect. 5.【Lifetime Guarantee】If you are not satisfied with it. Please feel free to contact us, we will offer you a FULL REFUND or new REPLACEMENT.